Successfully Added HK Warehouse Oukitel K10000 Max Android Phone - IP68, Android 7.0, 10000mAh Battery, Octa-Core CPU, 3GB RAM (Black) to your Shopping Cart. If you’re looking for the ultimate outdoor phone, the Oukitel K10000 Max rugged phone is perfect for you. This extremely durable smartphone features an IP68 waterproof design. Thanks to this, it is fully resistant to water, dust, and drops. You’ll be able to use it in the roughest of environments without needing to worry about the well-being of your Android device. But this is not all. 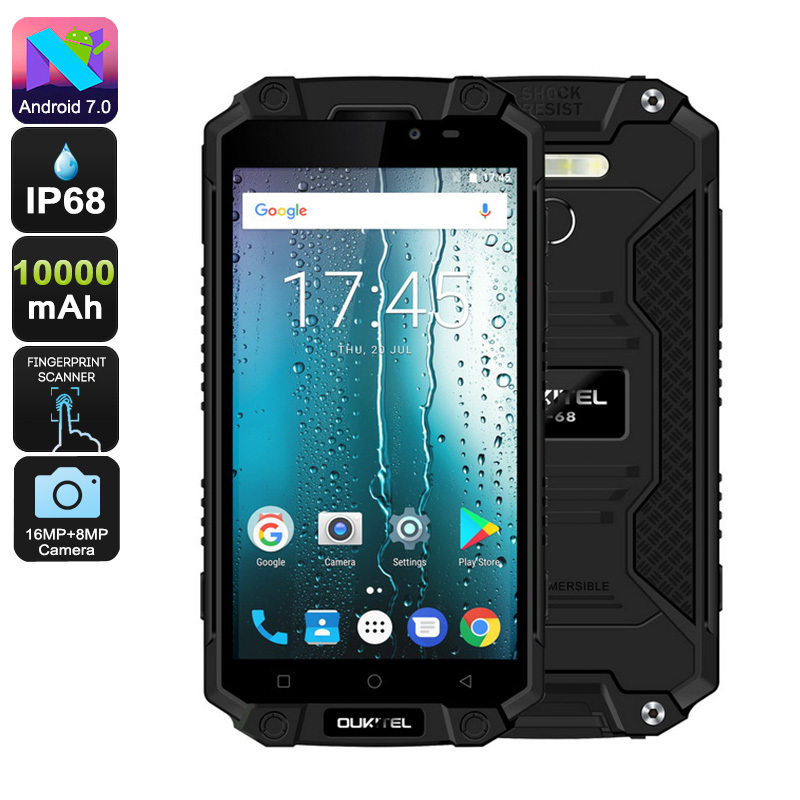 This rugged smartphone also comes packed with a whopping 10000mAh battery. This cell brings along an unbelievable 40 hours of continuous usage time and up to 15 days of standby time. With this rugged phone at your side, you’ll be able to head out into the wild for day’s in a row without needing to worry about running out of juice. When you’re enjoying the outdoors, this Android smartphone allows you to shoot stunning pictures with its 16MP intergraded camera. It treats you to 32GB internal storage and a 64GB SD card slot that offers plenty of space to store all your pictures and videos. Additionally, the phone also packs powerful hardware that includes an Octa-Core processor and 3GB RAM. This allows you to tackle the most demanding Apps and games. No matter what you throw at this Android phone, the Oukitel K10000 Max will handle it all. To ensure that you’ll always stay connected, this Android smartphone supports Dual-IMEI numbers and 4G. It lets you slide in two SIM cards at the same time while offering the possibility to stay connected to both. Thanks to this, you can always be reached on two different phone numbers while using merely one smartphone. With its Android 7.0 operating system, you’ll be treated to a smooth and lag-free user experience at any time of the day. The Oukitel K10000 Max smartphone comes with a 12 months warranty, brought to you by the leader in electronic devices as well as wholesale rugged phones..